$30 per person for Sideline Seats (regularly $39 apiece). Get your tickets before they are gone!! Please join us and help support Medford Soccer and enjoy an amazing night out!! Placement Evaluations for Fall 2015- Spring 2016- ALL players are expected to attend. Save 15%, even on already discounted sale items. 5% of all purchases go to Medford Soccer. 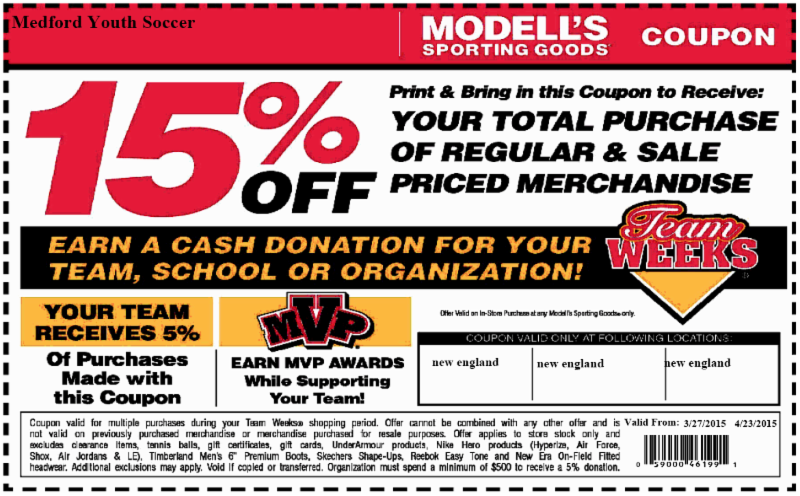 You can print the coupon below or just ask for the Medford Soccer discount. Click here to view/print a coupon. Mini Kickers Soccer is a brand new program that we will be offering on Saturdays this Spring for our youngest soccer players. Players aged 2+ years old through 4 years old can now join in the soccer FUN. This FUN program is being run by our training partner Challenger Sports with a curriculum specifically geared for this age group and features developmentally appropriate games and skills. If your 4 year old has already participated in our u6 program or currently meets the age requirements for u6 than they should sign up for u6 and not Mini Kickers. The dates in the table below are the Middlesex Youth Soccer League's (MYSL) recommended DOBs for placement into applicable Age Groups for the Fall 2014 and Spring 2015 seasons. Specific rules regarding placement for Travel teams may be found at MYSL's website at www.middlesexsoccer.org. All players (U6 through and including U18) are required to play all games in a Medford Soccer approved uniform. This means all players must be uniform in appearance and wear the same jerseys, shorts and socks as authorized by Medford Soccer. Fundraising Coordinator: Position Available. Interested? All Content Copyright Medford Soccer. Website by CHANNEL ONE of Medford, MA.